Abit has always been an innovative company and shown that they are not afraid to try new ideas out. 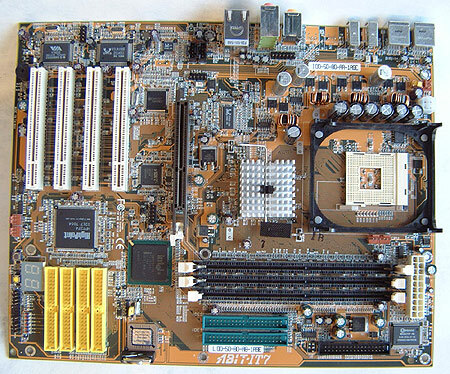 When their MAX line of motherboards came out they caused quite a stir because they were the first ever legacy free motherboards to be released. Legacy Free means there are no PS/2, Serial, or parallel ports on this board. Are we really ready for legacy free motherboards? Well, I know I'm not - my favorite keyboard hasn't been ported to USB just yet. With the high level of integration shown on the Abit IT7 we were still surprised to see that the IT7-MAX has just four PCI slots. Sure, some of the other motherboards in this roundup have more on board features, but the IT7 has everything you would ever need integrated already. It has on board 10/100 LAN, 5.1 audio (software codec), IDE RAID and even IEEE 1394! The BIOS of the IT7 MAX is very similar to the ABit BG7 which allows users to tweak memory voltages up to 2.8V. CPU VCore could be bumped up a maximum of 15%, and FSB adjustments range from 100-250 MHz in 1 MHz increments. It's a typical Abit BIOS, very powerful, and very good for overclockers! As you will see in the upcoming benchmarks, the stock performance of the Abit IT7 was a little surprising to say the least. More often then not, the board rounded out the last few spots of the benchmarks. The only explanation that seems to fit revolves around all those USB ports taking too much in the way of system resources. Perhaps legacy free isn't as good as we initially thought it would be?